Most students enjoy spring break by relaxing and enjoying time away from daily routines. Athletes are the exception; some spent their break at games and tournaments. APPALACHIAN traveled to Leeds for the Greenwave Classic. They had one victory over St. Clair County and three losses to Ashville, St. Clair County, and Cleveland. Their win against St. Clair County was a nail biter. The score was tied at three at the end of seven, and the game went into an extra inning. Landon Snow singled and scored in the top of the eighth. St. Clair County was unable to produce any runs and the Eagles won 4-3. Max Glaze was the winning pitcher. He allowed three runs, seven hits, and struck out eight over his eight innings pitched. The Eagles collected six hits. Snow went 2-3 with 2 RBIs. Chase Payne was 2-3. CLEVELAND also participated in the Greenwave Classic. The Panthers won one game and lost three. HAYDEN journeyed south for the Gulf Coast Classic. They had a pair of wins and a pair of losses. The Wildcats first victory was over Rogers 14-1. Hayden had 12 total hits. Nick Purvis (3-3, 3 RBIs) and Ben Abernathy (3-3, 2 RBIs) led the Wildcats to their high scoring onslaught. Hunter Higdon took the win on the mound, surrendering just four hits and one run, striking out one and walking zero during his five innings. The team’s second win was 11-8 over West Point. Hayden had 11 total hits. Purvis was 3-4 with 3 RBIs. Abernathy was 3-3 with 3 RBIs. Hayden’s two losses were to Baldwin County 1-4 and Normal Community 2-3. LOCUST FORK played in the Greenwave Classic tournament last week as well. The Hornets had one win and three losses. They defeated Cleveland 10-6 in their first game. The Panthers were first to score, but the Hornets’ eight runs in the third sent Locust Fork to the top. Chase McDaniel led from the plate (3-4, 1 RBI). Lukas Huber and John David Fountain contributed with two hits each. Locust Fork’s losses were to Leeds and Ashville. ONEONTA played in the Oxford Spring Break Tournament last week. They had two wins and two losses. The Redskins’ first game and victory was over Randolph County. Oneonta had six runs in the first inning, five in the fifth, and one in the sixth in the 12-2 win. Daniel McCary was the winning pitcher. He surrendered six hits and two runs, struck out three, and walked zero during his six innings. Oneonta had 13 total hits, led by Jake Hodge (3-4, 3 RBIs). Beau Ragsdale had 2 hits, one being a homer, in his three at bats; he had 2 RBIs. Luke Hodge was also 2-3 with 2 RBIs. The Redskins’ second win looked to be a tossup until the top of the seventh. The game was tied at two. Beau Ragsdale doubled and scored two runs and Will Moye singled and scored two runs and the Redskins won 6-2. Oneonta hammered out 13 hits. Ragsdale was 3-4 with 2 RBIs and Jacob Green was 3-4 to lead the Redskins. Brodie McCracken received the win from the mound. He surrendered three hits and two runs, struck out 10, and walked zero in his seven innings pitched. Oneonta’s two losses were to White Plains 6-7 and Piedmont 1-4. SOUTHEASTERN was successful in their one game last week, winning 8-5 over J.B. Pennington. 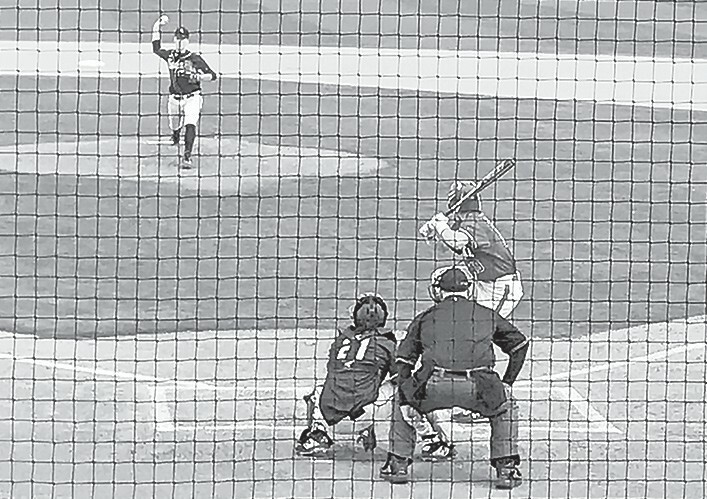 The Mustangs started the game with two runs in the first inning, and then it was slow moving until the sixth inning when they scored three runs. They added three more in the seventh. Southeastern had 12 total hits. Albert Tinney was 3-3 to lead at the plate. Tinney was also the winning pitcher. He surrendered one run on three hits, struck out eight, and walked zero during his three innings pitched. APPALACHIAN traveled to Spring Garden for their spring break tournament collecting three wins, one loss, and one tie. Their wins came agains Glencoe (9-5), Gaston (6-2), and Ariton (3-1). They tied Hokes Bluff (4-4) while losing to Spring Garden (1-3). Against Glencoe, Aleigha Wilson led from the plate (2-2, 2 RBIs). Against Gaston, Ashley Whittington led with two hits in three at bats. She also led from the mound surrendering one hit and zero runs during her three innings pitched. After a heart breaking loss to Spring Garden, the Lady Eagles rebounded finishing up the two-day tournament with the victory over Ariton. HAYDEN represented Blount County well in the Gulf Coast Classic going 4-1. They are 18-3 on the season and still checking in at number one for class 5A. The Lady Wildcats opened the tournament with a 5-0 victory over Carmel Catholic behind the strong pitching of Savannah Painter and Miah Simmons, who picked up the win. Gracie Benton went 2-2 from the plate to lead the Wildcats in hits. Next, they faced Marshall County finishing that game 9-0 as Hannah Cox and Emily Adkins combined for the shut out. They started off strong, scoring five runs in the first inning, with Lindsey Smith, Olivia Armstrong, and Brenna Hays recording RBIs. The Wildcats tallied 11 hits in the game as Kaitlyn Belding (3-3), Woodard (2-4), and Smith (2-3) each racked up multiple hits. Game three was a close one, but the Wildcats came away with the 4-2 victory. They got on the board in the first when Belding doubled on a 1-1 count, scoring one run. In the bottom of the second, Siegel tied things up at one, but the Wildcats pulled away for good with three runs in the third off the bats of Smith and Armstrong. Cox was credited with the win pitching five innings, allowing two runs on six hits, and striking out one. The Wildcats racked up seven hits in the game with Taylor Yeager and Belding each collecting two hits to lead the team. The Wildcats were on fire in game four as they shut out Chester County 18-0. Simmons and Painter combined for the no-hitter allowing only one walk. Woodard (3-3) led the team in hits. In their final game of the tournament, both teams were strong on the rubber, but Northview was just a little stronger handing the Wildcats a 1-2 loss. Cox started for the Wildcats recording 13 outs allowing seven hits and two runs over four and a third innings. The Wildcats collected seven hits on the day with Smith (2-3) and Gracie Benton (2-3) leading the way.